Smart-Tees is a creative force in T-Shirt Design & Printing. 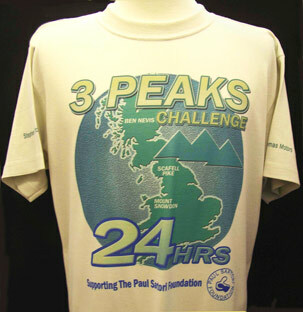 We enjoy working with groups and clubs to design and print T-Shirts for events or special occasions. Wether you need something to convey a fundraising message or yearn for something glamorous we can print just the thing you need. We have many styles of clothing to choose from just take a look at the online catalogue. Then we only use quality printing methods from a dye print, through brightly coloured or special effect films like Glitter and Sparkle, to coloured Rhinestones and studs. T-Shirts for a group trip to York, design applied in Low-Sheen Gold, Silver and Copper film. T-Shirts for a charity challenge walk(L) and group taking a trip to Spain on holiday (R) printed using a dye process on a sports T-Shirt for extra durability. T-Shirts for a very good cause(L). South Wales Fire & Rescue Service put on a Ladies Driving challenge every year to raise money. This group was the Stigettes and had their hands on large equipment for the day. Printed with a durable dye process. T-Shirts for a band (R) in Silver Sparkle film(the photo doesn't do it justice).